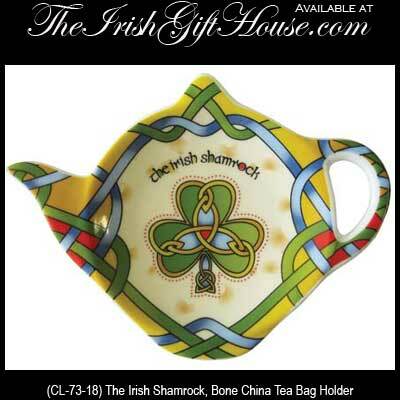 This shamrock tea bag holder features a teapot shaped design that is made of fine bone china. The Irish tea bag holder is enhanced with colorful shamrock along with Celtic knot-work and measures 5 1/2" wide x 3 1/4" tall. The Celtic tea bag holder is dishwasher and microwave oven safe and it is made in Ireland by Clara. 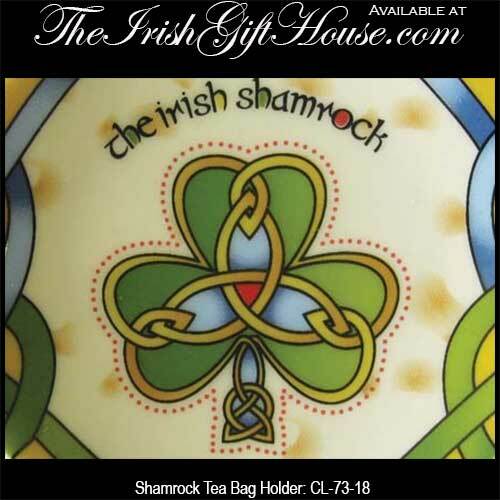 The Irish tea bag dish is gift boxed with shamrock and Celtic knot history cards that are compliments of The Irish Gift House.